Satisfaction Prediction Scores can be an extremely valuable tool in your customer service toolbox. They predict how pleased (or displeased) a customer is likely to be with your assistance, based on data, satisfaction ratings, and other metrics collected from past customer interactions. For more information about how Satisfaction Prediction Scores are generated, see About Satisfaction Prediction Scores. Once you have received enough satisfaction ratings, administrators can activate satisfaction prediction via the Satisfaction tab. Click the Admin ( ) icon in the sidebar, then select Settings > Customers. In Configuration Options, select Enable satisfaction rating prediction. Satisfaction Prediction Scores are displayed visually (as a small bar), and numerically (as a ratio). The bar's appearance depends on the score, scaling from red (for lower scores), to orange, to yellow, to green (for higher scores). In ticket views, in a sortable column. In tickets, the current score is at the top of the ticket, and the score history is included in each ticket event. In Insights, as a tab in the pre-built dashboard. Note: Prediction scores are only done for tickets created or updated after you enable Satisfaction Prediction. Tickets existing prior to enabling this feature will not receive prediction scores until they are updated. You can sort the tickets in the view by Satisfaction Prediction Score by clicking on the column heading. To display the Satisfaction Prediction Score history, you need to select Show all events using the events button. By default, all agents can see the predicted satisfaction rating when they are viewing a ticket. You may not want to make this information available to all agents. Note: Agents will still be able to see predicted score ratings in any shared views presenting the data or when looking at the history of a ticket. The score is only hidden from the top of the ticket thread. Click the Admin ( ) icon in the sidebar, then select Manage > People. Find the role you want to edit, and then click edit. In the Tickets section, select Can view satisfaction prediction for tickets to allow this role to view scores. Deselect this option to prevent this user from viewing scores. For your satisfaction prediction scores to have a real impact on your overall customer satisfaction ratings, you need to incorporate the information into your work processes, by using them as conditions integrated into business rules to power views, automations, and triggers. Collect tickets with low scores into a single view. Bump the priority of tickets predicted to be below 30% probability. Notify certain agents (or other stakeholders) when a ticket drops below 20%. Reassign tickets to specific groups based on probability scores. Apply a different SLA policy. You can include prediction scores in existing or new views to sort tickets based on how likely they are to earn a bad rating from customers. For example, if you create a ticket view that includes only tickets with a probability of <20%, this can help focus agents on the tickets that may become problematic. Let’s say you want to create a view for unsolved tickets with a Satisfaction Prediction Score below 20, so all at-risk tickets are in one place. You would use the Satisfaction Prediction Score as a condition when defining a new view. Click the Admin ( ) icon in the sidebar, then select Manage > Views. In Formatting options, drag the Satisfaction Prediction Score tile under Columns included in table. You can use the same criteria to create a trigger to send an email to Tier 2 Support agents, so they can intervene in the at-risk ticket. Similarly, you can create an automation to check for low scoring tickets periodically, and send the same email. Click the Admin ( ) icon in the sidebar, then select Business Rules > Triggers. For more information on working with triggers, see Streamlining workflow with ticket updates and triggers. Wow, this seems like an amazing tool! Customer service is our USP, therefore we are very eager to use this. In this article you mention "you need a minimum of 500 satisfaction ratings", however in another article (https://support.zendesk.com/hc/en-us/articles/218050717-Introducing-Satisfaction-Prediction) you mention "this feature also requires a minimum of 500 satisfaction ratings per month". We do have more than 500 ratings in total, but only around 150 per month. We really hope we can use this feature. Can we and if not, will it be possible in the future? Look forward to hearing a reply. Maybe there is a way to train the model on historical data? Maybe an ask for one of their internal teams ? Same here, if we have that minimum of 500 in total, but each moth these are less than 500, is this going to work? Hi, all. Sorry for the error - as I understand it now, you need 500 *per month*, and should have at least 1,000 ratings total if possible. My interpretation is that we all need to wait at least one month for Zendesk to build up enough data about our accounts for this tool to begin working correctly. @Zendesk, can you confirm this? This is very cool. We get escalations sometimes and it's great to be able to have the system predict which ones may go side ways before it actually occurs. "My interpretation is that we all need to wait at least one month for Zendesk to build up enough data about our accounts for this tool to begin working correctly. @Zendesk, can you confirm this?" Hi Jon! Sorry about the delayed response here. Support is currently working with Product to find out what's going on here. I'll be sure to post here when we get it figured out! "Satisfaction Prediction uses a Machine Learning process to train a model for your account. Although you meet the minimum initial criteria to have a model built, there is a validation process that is applied to the model to ensure it can accurately predict the outcome. If the model doesn't perform well enough, then the feature cannot be enabled. To overcome this problem we simply need more data. It is possibly due to the types of tickets you have - if they are too varied, with insufficient good and bad ratings then the model won't perform well. The automated model building process will continue to attempt to build a new model for your account. Once it is able to successfully build a model that meets the threshold, the feature will become active and your account administrators will receive an IPM and email to notify them." I'm curious about how satisfaction prediction works with Hub and Spoke. Will the prediction come over to my Hub account with the ticket? I see that I need to turn it on at the Spoke level, but I'm curious about whether I'll need to also log into the Spoke to see this feature. @Andrea, The satisfaction prediction stays inside the Spoke accounts and isn't carried to the Hub, so you will need to log into the Spokes to see those predictions! Sorry for any inconvenience this might cause, but satisfaction is generally separated so one Spoke doesn't have a great influence on all the others. Let us know if we can answer anything else! We were very enthusiastic about this feature at start. After using this for 1 month, we find that the predictions are way off, making this function useless. Therefore we've removed the function. Perhaps it works well for larger companies with thousands of tickets per day. CAUTION: We did find out that clicking "Enable satisfaction prediction scores", automatically enabled the System Automation "Request customer satisfaction rating". Automations should never be activated without the user knowing...! Hi Wouter, thanks for sending your feedback through. I'll try answer the 2 parts of your experience, first - the prediction scores: Because of how we normalise the prediction scores (to ensure stability for your automations / triggers) the score itself may not seem accurate - we are currently reviewing alternative options for showing the score but the best way to interpret it is to take your long term CSAT rating (i.e. your current CSAT score overall, over a period of time). 100 - this score should give you an accurate threshold for where a ticket moves between good and bad, e.g. 100 - 88 = 12. Scores below 12 are high risk for negative ratings. We've validated this across many accounts using the feature. In terms of the second issue - this is actually not related to satisfaction prediction but rather an unfortunate bug related to the core CSAT feature where saving that form again will cause the system to interpret this as activating CSAT even though it was already active. This is now a known issue and should be resolved shortly. Indeed, if you simply updated a standard CSAT related setting then the re-activation of the trigger also would have occurred. 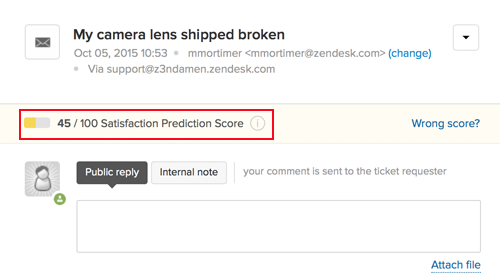 We have multiple teams using Zendesk but not all of them are using satisfaction surveys. How do the tickets belonging to the teams not using CSat affect the satisfaction prediction scores, or do they? Is there a way to isolate the machine learning to tickets for specific teams? Is there a way to isolate the satisfaction predictions to tickets for specific teams? Tickets that don’t get a CSAT score don’t get used in model training, and won’t influence satisfaction prediction scores. No, there isn’t. The ticket ingestion pipeline that feeds the model training process cannot discriminate on the basis of teams. Unfortunately no. 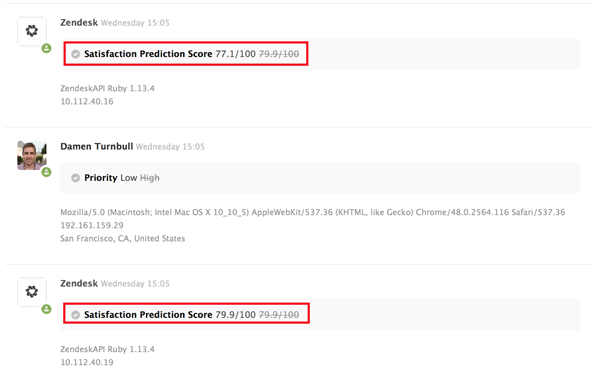 Satisfaction prediction is enabled globally, there’s no way to configure which teams will receive predictions. You can customize whether or not an agent will see a score at the top of a ticket thread, but even when not showing the prediction a score is still calculated. Is there a way to route tickets with low satisfaction prediction to certain agents that have the best CSAT in their group / skill? Can the satisfaction prediction model automatically select the best agent for the ticket?